After the most recent summits in Hong Kong (2009) and Lake Louise (Calgary/Banff) (2011), the 13th edition of the International Conference on Computers in Urban Planning and Urban Management (CUPUM) takes place in the city of Utrecht, near the geographical center in the Netherlands. 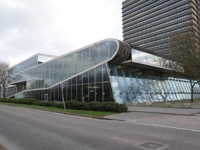 The Faculty of Geosciences of Utrecht University will be organizing the event from 2-5 July 2013 at the Uithof Campus in Utrecht. The conference is over. You can download all published papers and posters, that were made available on the provided USB Stick during the conference, by going to our micro site, by clicking here. All published papers & poster submission, that have been provided on the accompanied USB Stick during the conference, have been made available for download. To view them, please click here (internal micro site). The opening and keynote speeches are available for download. Please check the download section. The full programme has been published now. Please go to the Programme page for more information, or download the programme directly, by clicking here (PDF, 535 kB). From June 27th until July 11th, major maintenance and construction works affects your train journey to Utrecht, if you are travelling from the airport to Utrecht, or from South East Netherlands to Utrecht by train. The deadline for early bird registration has been extended up till April 22, 2013. Thereafter, the regular registration fee of 400 euro (instead of 360 euro) is valid. Information about hotels & accommodations has been published. We do not provide any accommodation, but we do offer arrangements via Preferredreservations.nl. For more information, please go to the hotels page by clicking here. We would like to announce the registration module for the conference is now available! All accepted entries are required to register before April 1st, 2013. For more information, please go to the registration page by clicking here. The CUPUM 2013 local committee decided all current deadlines have been extended with at least one month (with exception of the deadline of the revised book chapter, which has been extended with only two weeks). This means the deadline for the conference paper and the poster submissions have been reset to February 15th and March 15th respectively. Please check the Dates for a full overview on all new deadlines. Click here for more information on the keynote speakers. Moreover, it is expected registration for the conference will commence within just a few days.